How to Care for Your Invisalign Trays? Every Invisalign patient has a story about their Invisalign treatment, and most important: their Invisalign routine. What works and what doesn’t work with Invisalign? How can I be a successful Invisalign patient? Are there specific things I (the patient) can do to make my Invisalign work better? After treating many Invisalign patients over the years, we have a good understanding of what works and what doesn’t work well. The goal for Invisalign Orthodontic treatment is always the same, to straighten your teeth, but how you get there is different from patient to patient. 2. Evaluate your progress. Yes … YOU (the patient) needs to evaluate your own progress. If your teeth do not fill the ‘space’ where the teeth are supposed to be moving, then it’s clearly not working as it was prescribed to move. Let’s take a look at this example on the right –>. Poor fit means that there is ’empty’ space where the tooth is supposed to be. Good fit means that there ‘no space’ or ‘slight space’ where the tooth is moving. 3. CLEAN THEM. You won’t wear Invisalign aligners if they are dirty / crusty / discolored. Simply put, if you do not wear your Invisalign Orthodontic trays, then your teeth won’t move. Visit our other YouBraces.com blog on “How to Clean a Crusty Invisalign Tray or Retainer at Home.” White vinegar is our recommended cleaning agent. We’ve heard that hydrogen peroxide works well too. 4. Buy a Denture Brush. These are larger, stiffer bristels and have 2-sides to them. As mentioned in How to Keep Invisalign Clean on sunshine-blog.com. She mentions “Get an end-tuft toothbrush to clean the nooks and crannies in your aligners.” On Amazon.com, you can find GUM Double Ended Brush for $5 each. Our office gives these exact same ones to our patients. What about Denture Cleaner Tablets? These are good, not great. They will definitely freshen your aligner, but the best way to keep them clean of mineral deposits and discoloration is manual debridement with your denture brush. Scrubbing away anything that’s not supposed to be there will keep them cleanest. Use of the denture tablets is similar to soaking them in mouthwash. What’s the Minimum Amount of Time that I can Wear my Invisalign Trays? We sometimes get asked …. ‘What is the minimum amount of time I have to wear my Invisalign to work?’ That answer is tricky because everyone’s teeth move at different rates. The more difficult the movement, the longer it’s going to take. Ideally, I want to see patients wear the Invisalign 20 hours average. 18-22 hours per day is good average goal. Dr. James and Dr. Robert are one of just 10 members of the Orange County Advanced Invisalign Study Club, comprised of OC’s top Invisalign Doctors. Passamano Orthodontics is an Elite Preferred Invisalign Provider, which means we are among the top level Invisalign Doctors. 2014: Drs. Robert and James Passamano will be awarded a Top 100 Invisalign Doctor at the November 2014 Invisalign World Conference. This distinction was based solely on case results voted by orthodontic colleagues. 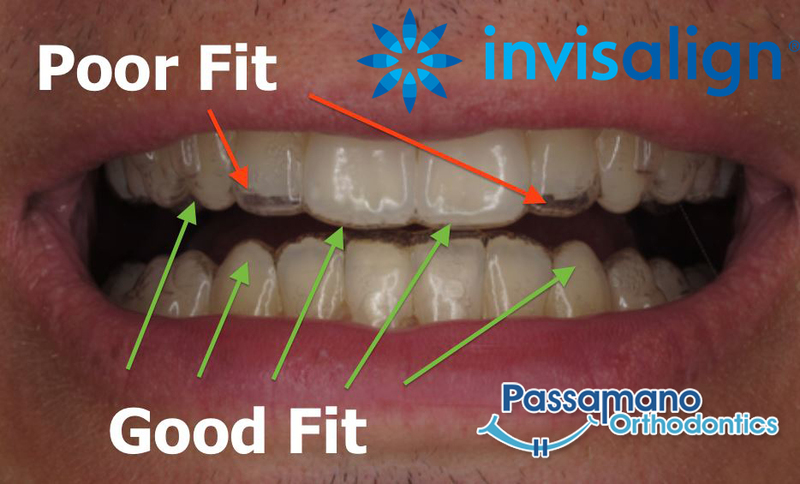 Passamano Orthodontics had 3 separate patient cases in the Top 100 Invisalign. 2014: Accelerated Invisalign Treatment: We offer an Accelerated Orthodontics treatment modality to decrease treatment time by 38-50%. 2012: Dr. Robert earned 2nd Place in the 2012 Invisalign Gallery Competition. 2012: Dr. James was invited and received special training at the Invisalign Headquarters in Costa Rica. 2010: Dr. James was featured in the 2010 Invisalign Gallery of top Invisalign results.